Report on the Operations in the Vicinity of Shaiba 12th-14th April 1915. Simla: General Staff India, 1915. The record is made up of 35 folios. It was created in 1915. It was written in English. The original is part of the British Library: India Office The department of the British Government to which the Government of India reported between 1858 and 1947. The successor to the Court of Directors. Records and Private Papers. 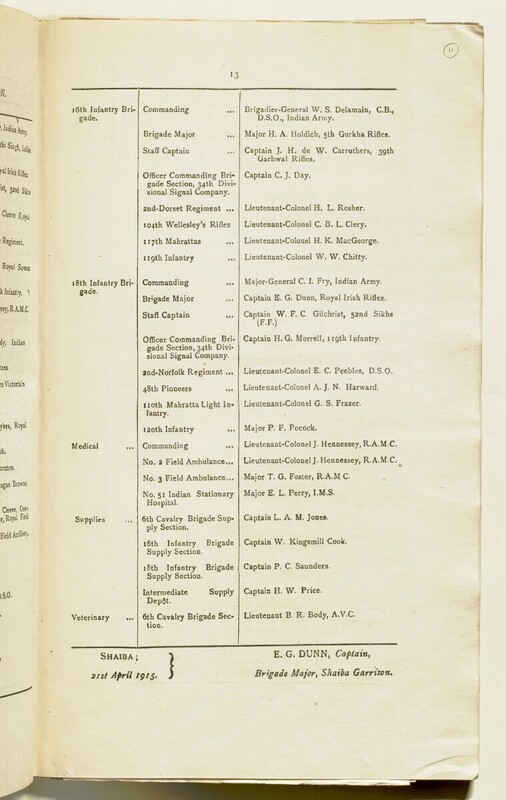 This file contains military despatches regarding the Battle of Shaiba that took place between British and Ottoman forces on 12-14 April 1915. The file begins with an introductory letter from General Sir John Eccles Nixon, Commanding Force "D" to the Chief of General Staff, Simla (folios 4-6) that is followed by a report related to events of 11-12 April written by Major-General C. I. Fry (folios 8-10) and another report that concerns events of April 13-14 written by Major-General C. J. Melliss (folios 14-19). The file contains a number of maps and sketches of the battlefield and surrounding area. The file contains an contents page (that uses the original printed pagination system) on folio 3. A bound, printed volume. The file's foliation sequence commences at the front cover and terminates at the inside back cover; these numbers are written in pencil, are circled, and are located in the top right corner of the recto The front of a sheet of paper or leaf, often abbreviated to 'r'. side of each folio. Please note that ff. 31-34 are housed within f. 35. The volume also contains an original printed pagination sequence.